Work on the detection of strange radiation , which accompanies the process of cold transmutation in the prototype LENR reactor with the project " Energoniva ". According to our preliminary estimates, this radiation can carry with it the energy released during the passage of nuclear reactions. Perhaps, in the nature of this phenomenon laid the key to building power plants based on LENR reactions . Objective: repetition of previous results with the country of registration of radiation. 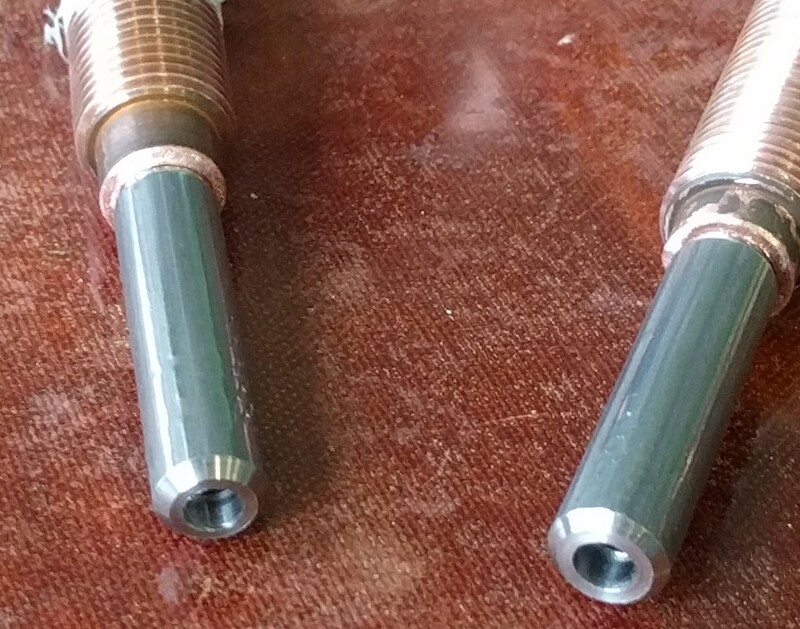 To reduce the influence of copper on the discharge electrode, it was decided to make a long titanium inserts, see. Pictured below. This is not a drastic measure to remove the copper, but this way the number of copper in the sediment should be less. The electrodes were a little long, and when you try to shorten a titanium electrode was broken. 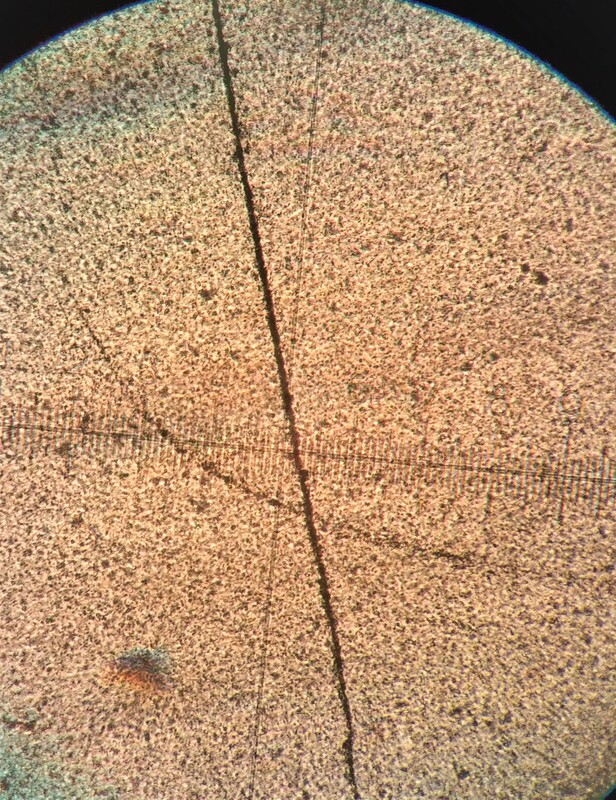 The copper electrode was left small titanium threaded portion, a file that has been treated to obtain a flat surface with copper. Looking ahead, below shows the pair of electrodes after a few minutes in the reactor under the old scheme Pan'kova-Kuzmin. X-ray film were located as shown in the photograph. The permanent magnet facing the south pole up and down the north. №3 film located at a distance of 0.5 meters from the reactor. 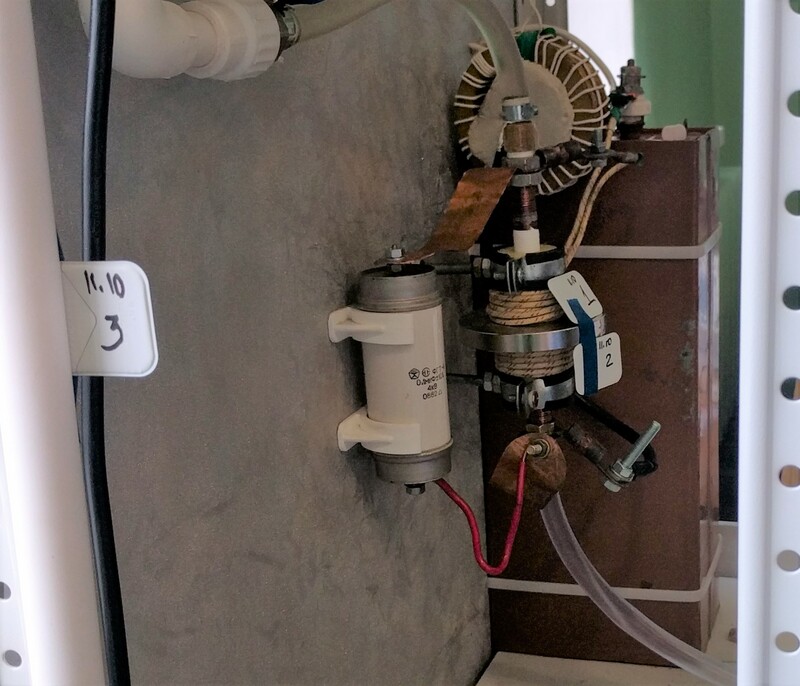 In an experiment to measure the voltage on the magnetic coil and the reactor current in the circuit discharge capacitor-coil-tubular electrodes. The current measured by a current transformer with a homemade conversion coefficient 42A / Volt. Typical waveforms are shown below. The red beam - the voltage at the magnetic coil reactor (100 volts per cell); yellow beam - the current in the discharge circuit. The oscillograms clearly seen that the discharge starts from high frequency oscillation current further increases smoothly and performs damped oscillations before the current interruption in a plasma. The frequency of oscillation is approximately equal to 4.5 kHz, determined by the discharge capacity of 100 uF and the magnetic inductance of the reactor coil. Single Discharge may occur at relatively low voltage both on the upper waveform - 160V, and at relatively high voltages; the lower waveform 500 volts. Horizontal 50 microseconds, in the cell. 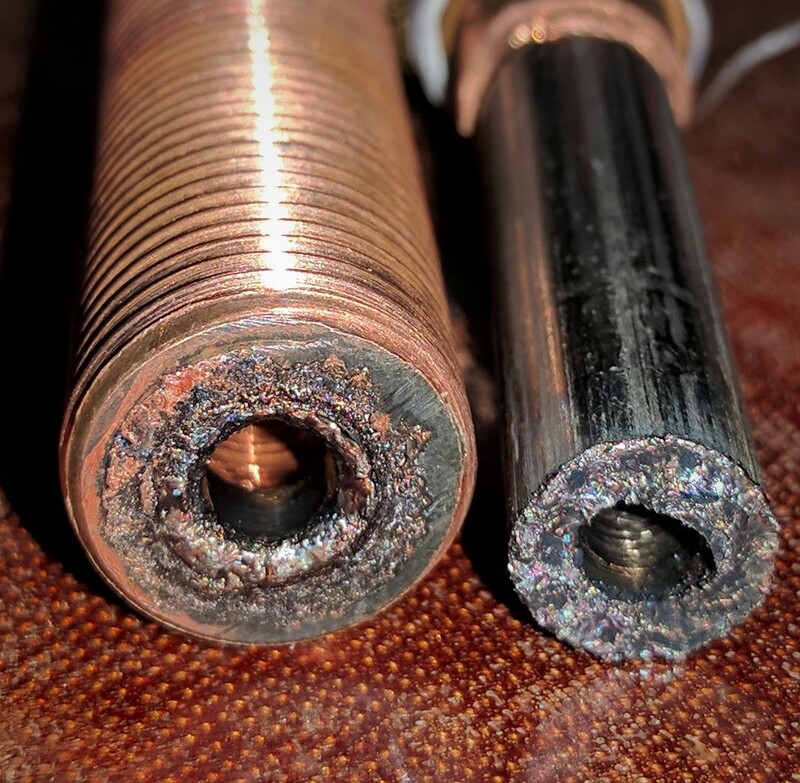 Regardless of the occurrence of the discharge voltage, early high-frequency vibrations occur and the voltage on the coil and the current in the discharge circuit. 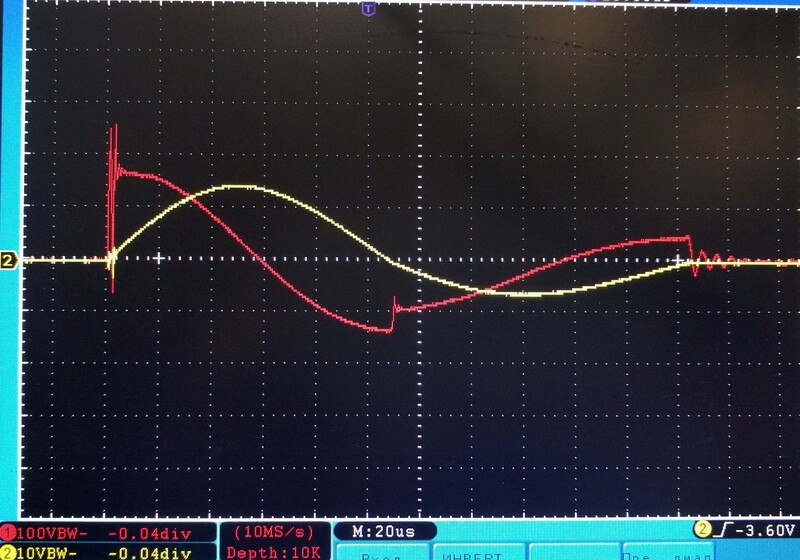 Below is a waveform stretched in time to the previous waveform. Measured c via the current transformer is frequency current amplitude reaches 200A and the whole process lasts less than 1 microsecond. There are serious reasons to believe that at this moment triggered transmutation processes . Further increase of the current through the reactor leads to a useless and destruction thermalization plasma electrodes. 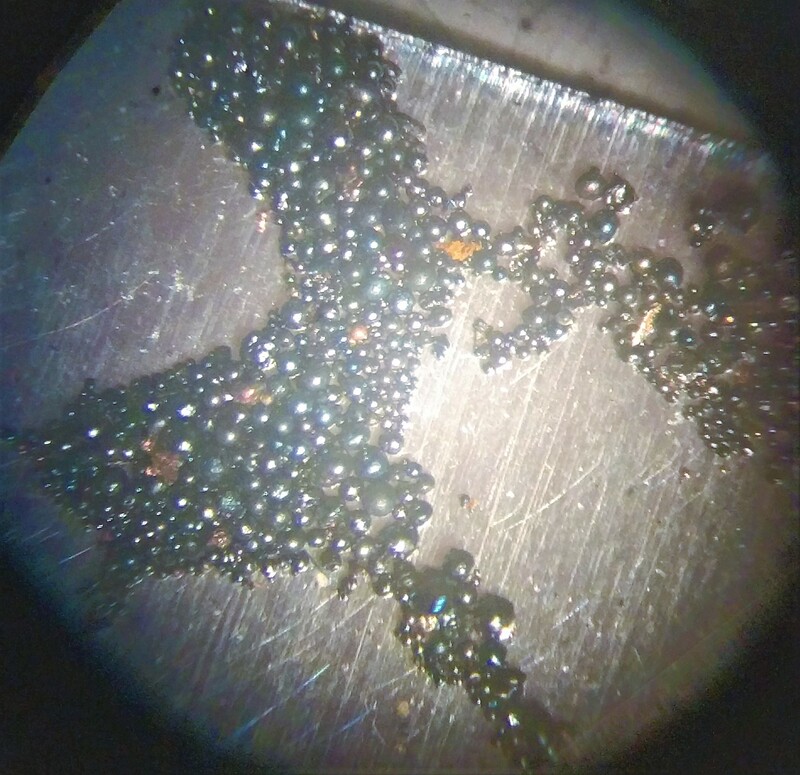 mostly resulting precipitate is titanium beads, their appearance under a microscope photograph presented at below. Compared with the previous case of the copper shot is clearly very little - in the previous experiment were about 30%, suggesting that the presence of copper does not lead to precisely the copper shot. They are formed from titanium and water! These spectrometric analysis will be presented later. Now that we have shown the X-ray shown by X-ray films. The photo below shows a portion of the film №2 with illuminated top right-hand side and a long track. 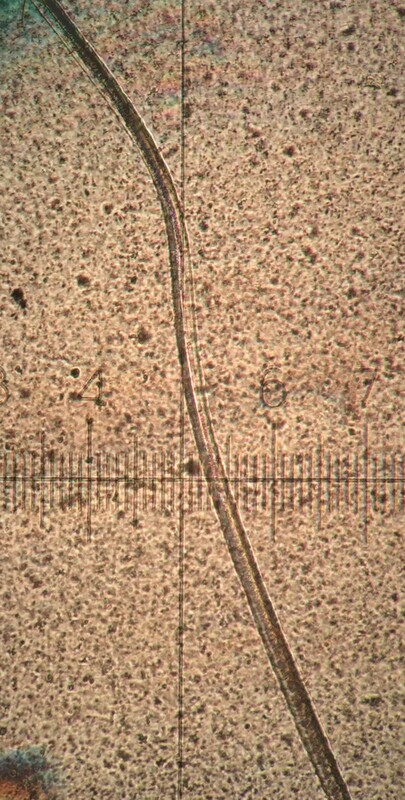 Successive pieces of the lower elongate track in the photographs presented below. A characteristic feature of the tracks is a double spiral track in the case where the reactor includes a film emanations from an end face parallel to the plane of the emulsion . A different picture is observed when emanations come to the plate normal or close to normal . 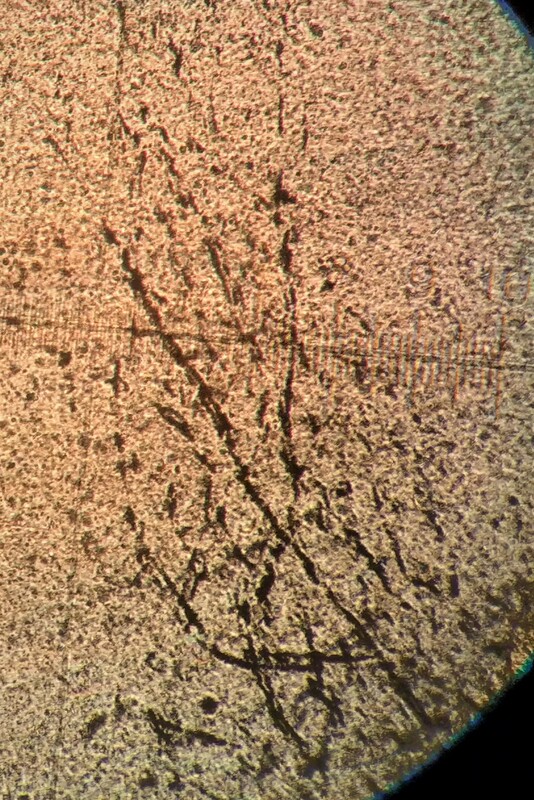 The following picture shows the trace found on the film №3. On the tape, №1, installed at the south pole of the magnet was able to find the track, shown in the photo below. 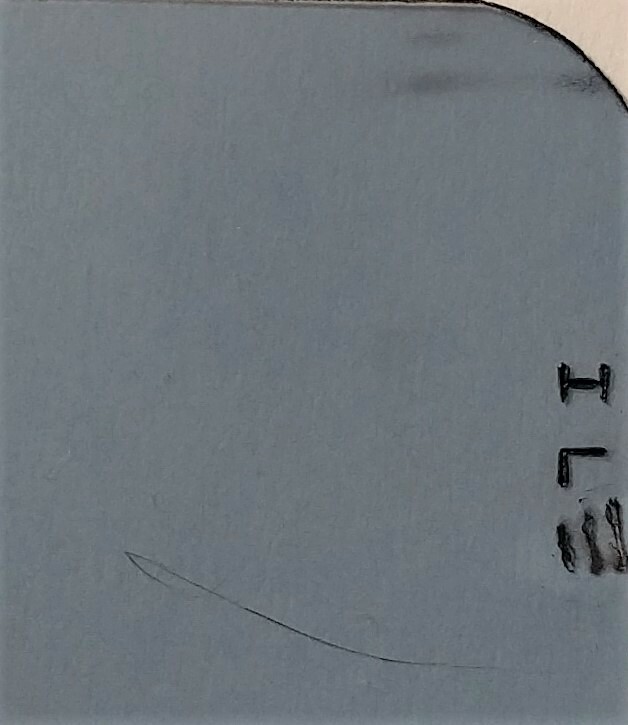 The photograph is viewed another, finer structure which is clearly visible under magnification (h135), see. Pictured below. 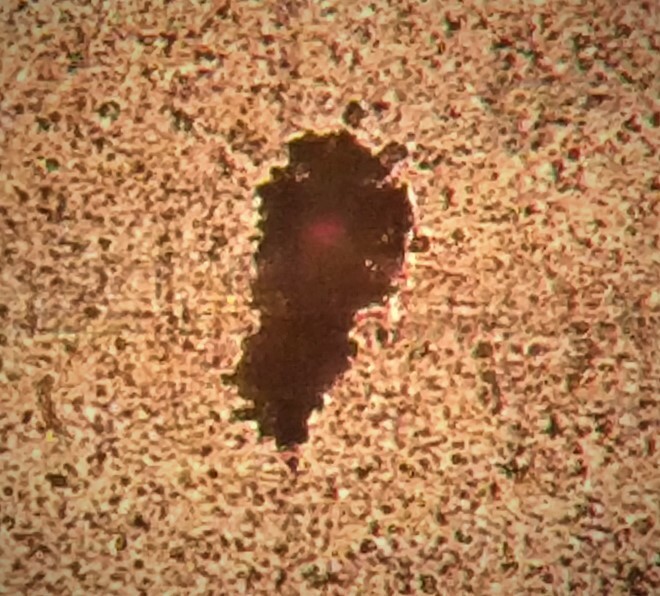 Apparently, except emanation passage emulsion layer dives even a plastic substrate, and it is melted, leaving a spiral track. It should be noted that the resolving power of the X-ray emulsion is 40 lines per mm, and in principle, it is not able to display such a shallow helical structure as pictured. All microscopic photographs were taken in transmitted polarized light microscope MIN-8. 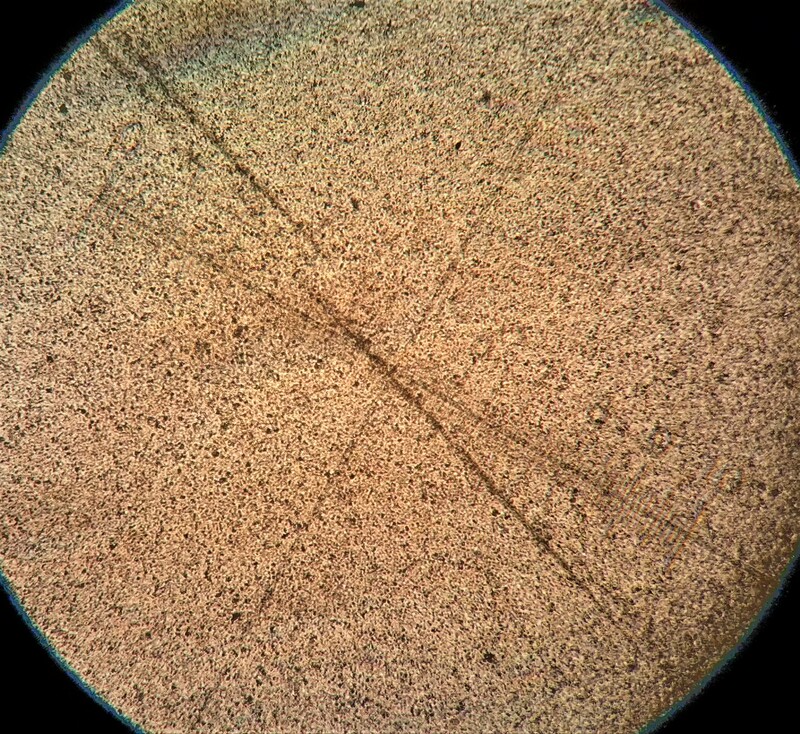 I don't see any spiral tracks - only filaments of cat fur and another impurities over picture. The reactor contains lotta copper parts, which will dissolve and precipitate back again at surface of aluminum, iron or titanium - no evidence of nuclear reaction or radiation has been given. It is difficult to be sure about these things, but there does seem to be evidence there of 'paired pits' in the substrate. These are also apparent in some photomicrographs I took of the inside of one of 'LION's' fuel tubes, discussed on ECW.